If you are reading this, then you wished to know more about me and my work. Well, My name is Raja and I am from India. I hold a bachelor’s degree in information technology and I write softwares for a living. This blog is my way of giving back to the technology community and a record of my attempts to make the world a better place. Have you heard of the nerd who works in a multinational company for a few years filling up excel sheets and then realizes the Indian IT companies are not real software companies, finally quits his job; stays at home and sits 10 hrs in front of his system trying to become a software developer. Well, that’s me. If I know how to do something I do it, if not I learn how to do it and then do it. That’s my technical expertise described in one line. So, if you are a long lost friend or a multi-million dollar company looking to hire me to work on your ideas or simply someone who wants to say hello, please feel free to contact me. 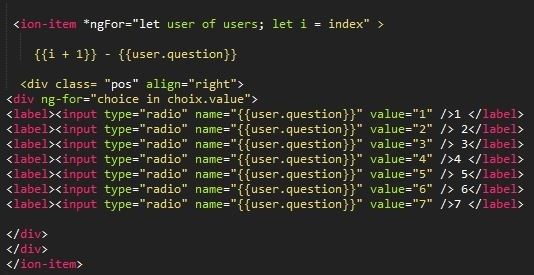 i’m a french student and i need to use Ionic 2 for a school project but i’m stuck with something in the code. the project is about making an app displaying a Multi choice Questionnary for children at school. i need to collect data about choices they will make for each question. below, the part of my code where i need to add something in order to insert these buttons value to a firedatabase (that i already use for questions table). How can i insert values chosen in a firebase database ? I need this function working very soon to validate my final grade.